Thin is in again this year, people, just when we thought that dubious advantage of one smartphone before the other has gone the way of the Dodo. Manufacturers, from Sony through Huawei to local hero Chinese brands, are racing to come out with the "thinnest" title this year. We are not entirely sold on the super-slim idea, as it makes the phone uncomfortable to grab when lying flat on the tablet, for instance, and leaves less space for battery and other internals, not to mention the potential heat dissipation and general endurance issues. 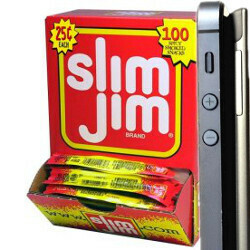 There's no denying that slim looks elegant and sophisticated, however, and a lot of users are willing to trade functionality for looks, thus we are rounding up this year's Slim Jim releases in the sub-8mm Android universe, for a closer look what happens on a low-carb diet. Umeox X5 is nothing but a flash in the pan prototype at this moment, though promised to arrive by year-end on retail shelves. It will most certainly hold the "thinnest" title then, as its dimensions are listed with just 5.6 mm (0.22") thickness. The manufacturer has confirmed the rest of the specs as a 4" 360x640 pixels OLED display, dual-core 28nm MediaTek processor, 512MB or 1GB of RAM, microSD slot, and 5 MP front and rear cams. The battery will be 1400 mAh, though with this screen and processor that shouldn't be a problem for endurance. The best part is that Umeox is loading Android 4.2.2 on the handset completely stock, as many people prefer. Another locally-acclaimed Chinese manufacturer will take the second spot here, though they plan to release the Vivo X3 in August, rather than towards the end of the year, which will make the 6mm (0.24") handset the thinnest on the market until the Umeox X5 launches. It is promised to arrive with some funky high-fidelity sound tech, though the rest of the specs are not clear at the moment. Despite that it is a tad "thicker" than the rather dingy Umeox and BBK contraptions, the 6.18mm Huawei Ascend P6 is already released, and is one of the best value for money offerings in the Android midrange, with an HD display, premium metallic design, and a fairly generous 2000 mAh battery - all yours for about $400 without a contract. Planted in the affordable midrange segment, the 6.45mm (0.25") Alcatel One Touch Idol Ultra still sports a 4.7" HD Super AMOLED display and 8 MP camera, but the rest of the specs are an underwhelming MediaTek processor and 1 GB of RAM, plus no microSD slot. The 1800 mAh battery should be enough to provide you with the typical day of usage with these specs, though. And here we arrive at the thinnest Android phablet already - the Z Ultra is not only the phone with the largest 6.4" display out there, but it is also just 6.5mm (0.26") thick, offseting the effect of the giant dimensions a bit. It sports flagship specs, too, like a Full HD screen resolution and quad-core Snapdragon 800 processor. It also has the largest battery of all the anorexic Androids out there, at full 3000 mAh capacity. At 6.9mm (0.27"), the Lenovo IdeaPhone K900 is the second thinnest phablet this year, with its 5.5" Full HD display, all wrapped up in a premium mettalic chassis. The quirks don't stop here, though, as the handset is powered by an Intel Arom processor at 2 GHz, rounding the stellar specs up with a 13 MP camera, and the second largest battery of the bunch at 2500 mAh. Next in line is Alcatel's One Touch Idol X, and, along with ZTE Grand S, it's the thinnest Full HD 5-incher at 6.9mm (0.27"). The contender also sports a quad core processor, 2 GB of RAM and all the other prerequisites to keep you happy with its purchase like a memory card slot and a 13 MP camera. The 2000 mAh is a bit of a bummer, yet Alcatel cites 12 hours of talk time with it. Watching movies on this big high-res display will likely drain it much faster than average, no doubt. "Grand S is an intriguing proposition packing a Full HD 5-inch display, 1.7 GHz quad-core processor, 2GB of RAM, 13MP camera, 4G connectivity and Anroid Jelly Bean into a polycarbonate chassis which is just 6.9 mm (0.27") thick," applauds one of our user reviews, and ZTE rounds it up with a generous 13 MP camera on the back. One of the "fat" kids on the Slim Jim block pierces the 7mm barrier upwards to in fact reach just 7.18mm (0.28") thickness, and with it Motorola carries over the trim tradition of its RAZR brand. The DROID Ultra sports a 5" HD display, a homebrew Motorola processor with always-on functionality, and a 10 MP ClearPixel camera on the back - all prerequisites for a stellar experience with this thin member of the new DROID trio. Its spiritual DROID MAXX brother is slightly thicker in order to carry a gargantuan 3500 mAh battery, but the 2330 mAh of the Droid Ultra ain't too shabby for the specs either. At 7.9mm (0.31"), the Xperia Z is the thinnest waterproof handset out there, and that is a tribute to Sony's engineering prowess, as it also sports flagship specs like a 5" Full HD dsiplay, quad-core processor and 13 MP camera on the back, plus the presence of a microSD slot. The 2330 mAh battery capacity is also nothing to sniff at with these dimensions of the unibody watertight chassis. If thickness was what sells Android phones, the Galaxy S4 would be the last of the bunch listed here, but just the opposite is the case. Flaunting a 7.9mm (0.31"), it has the advantages of a 5" Full HD Super AMOLED display, fast processor and an excellent 13 MP camera module, not to mention the mojo of the Galaxy line behind its back. thinnest phones of the year .............2013 is over already ?! Man I haven't had a Slim Jim in forever. I am going to my local gas station & I am going to pick one up. SNAP!! in to a SLIM JIM!! OHH YEAHHHH!! R.I.P. Macho Man Randy Savage! Thank you for that nostalgic moment. I'm going to grab a whole box cause of that lol. Damn I miss the 90's. Snap in to a SLIM JIM OH YEAHHH! RIP MACHO MAN. Lol I'm laughing at this comment. Some of the S4 variants are made in China you hypocrite. Or Phonearena can just ban them/their IP and hope they are not smart enough to change it. If PA bans him, he could just make another account. Where is iPhone? It´s thinner than Xperia Z and GS4. Oh Gosh, this is about Android phones MrKoles. Oh yeah, I see now. Wow, these phones are so thin, definitely few would be from Chinese markets. Good to see that Sony and Samsung are in the list. No, but the iPhone 5 still holds up as a standard for thin and lightweight smartphones. http://www.youtube.com/watch?v=E3c8il_Q6SU I bet all those phones couldn't survive what the "fat" lumia took before (finally) breaking.